Although I’m a great Linux fan, i still have Windows on my personal computer, since the computer is not used by me alone, and although i have various Linux OS installed on this same computer, most of the time its on the windows mode. so what do i do when i need to test something on wordpress or mediawiki? For that reason i needed a development environment on my home computer that will run Apache, MySQL, php and Perl. There are some ways to go about that – i could have installed Cygwin, which is a Linux-like environment for windows. Another way to go about it is to install the windows version Apache and mysql and php and perl. These two options are fine solutions but they will need some more work on them , other then the point and click option which is xampp. and if you want to can add Perl 5.10.0-2.2.11 from their Add-Ons page. The install process is a next,next,next version of a regular windows install, and in the the end you have everything installed into the default location at C:\xampp. This is the windows control panel that stops and starts the Apache and MySQL for you if you don want to install them as services, personally i prefer to start them when I’m developing since they are resource heavy applications. 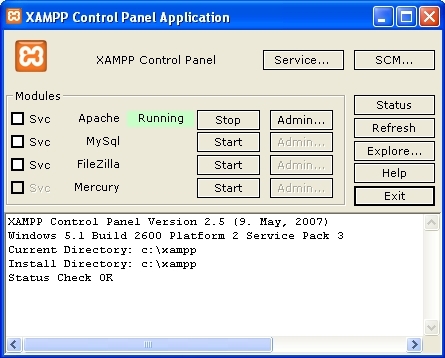 Another not is that the xampp on default is set to work with php 5 , but you can from the xampp configure page which is at http://localhost/xampp/ , use the “PHP switcher” and change the install to work with php 4 instead. And that’s it – your local development website is ready and is available at: http://localhost/ to play with. sorry to say but if your using XP, defragmenting your hard drive won’t do anithyng for your systems speed. The reason why is that XP saves everything on the hard drive fragmented thats how it works. If your using a FAT32 hard drive defragmenting will speed up the system but XP on a Sata hard drive will not.